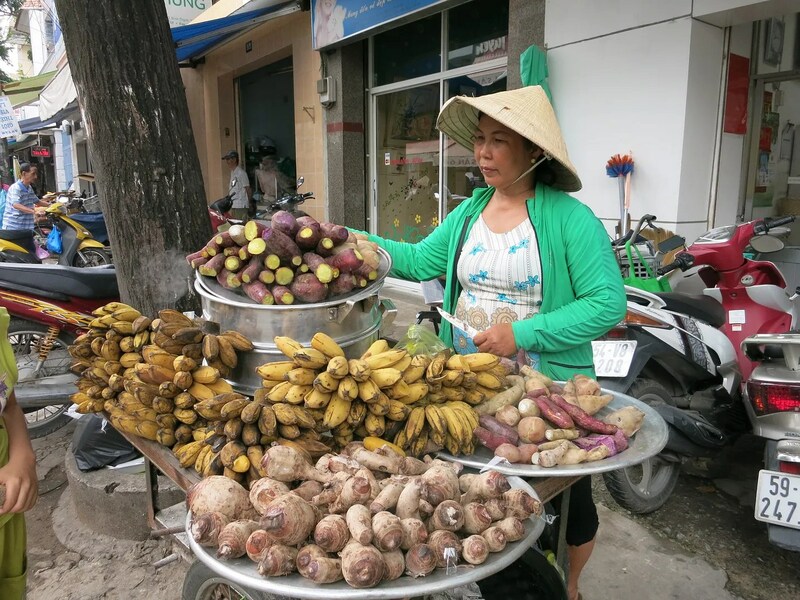 Saigon Street Eats | Hello Saigon! ← Keep the seat belt on. 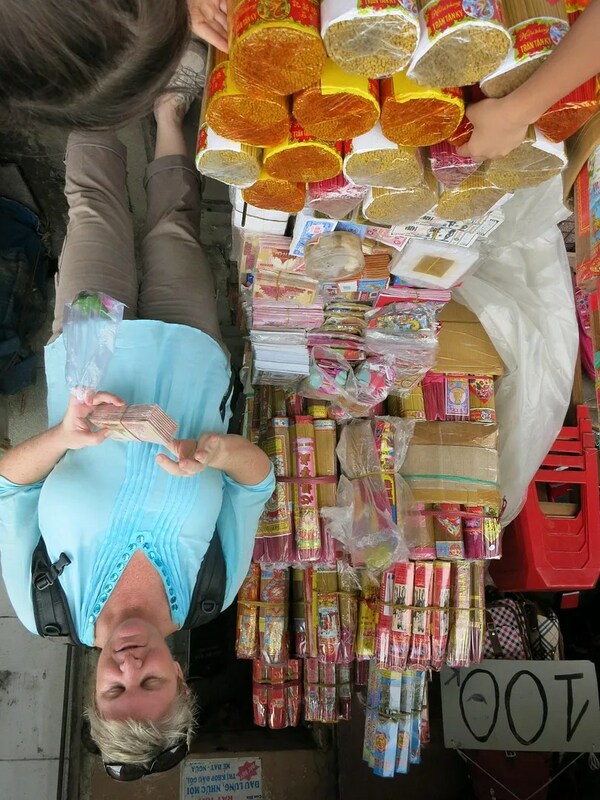 Finally, I met Barbara Adam of Saigon Street Eats! We’ve been living here for 5 years but honestly, I haven’t really walked the streets of Saigon a whole lot. So it was a real treat to finally go on a tour by Barbara (you can also read more about her in her blog, The Dropout Diaries). 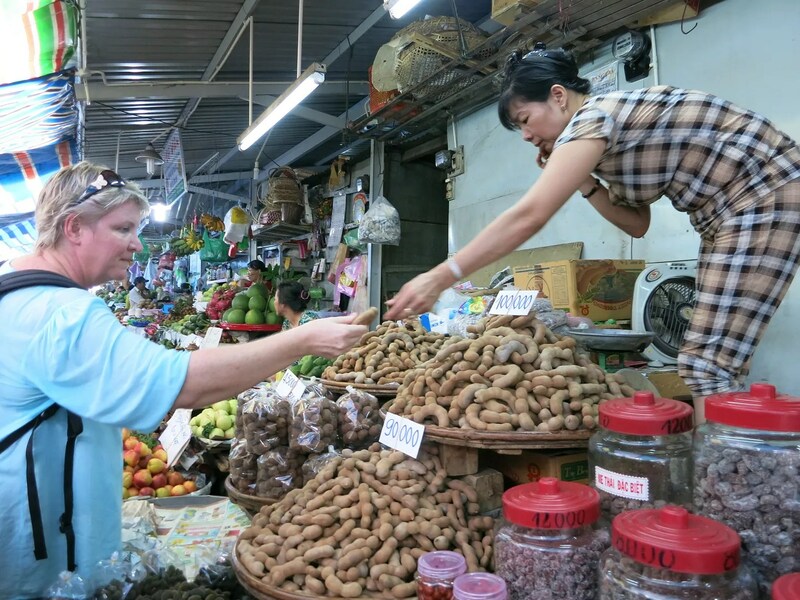 Barbara and her husband, Vu host foodie tours in Saigon. We met Barbara, Poppy, and Ynna (from NZ) at the Saigon Opera House early in the morning and our first stop was to have breakfast at a local pho restaurant. 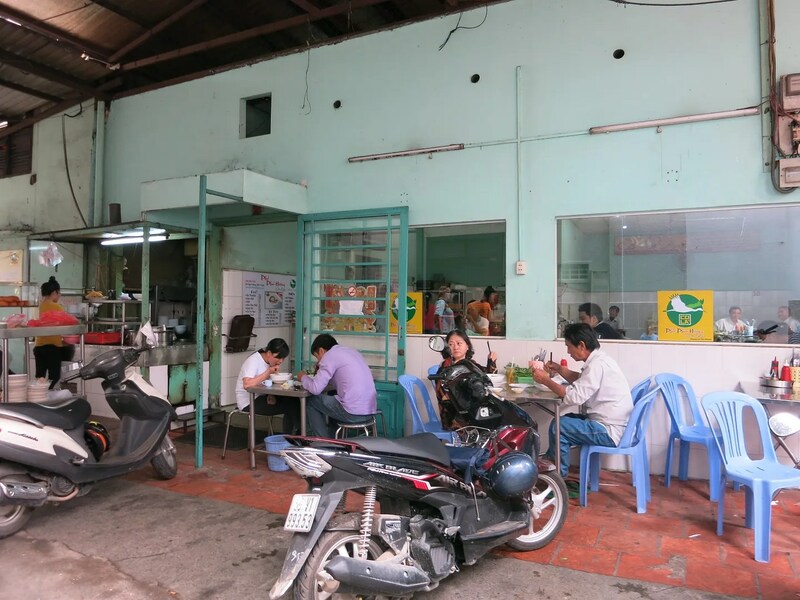 This little establishment along one of Binh Thanh’s busy hems has been in the business for some 30 years. The original owners have left but their pho recipe lives on. 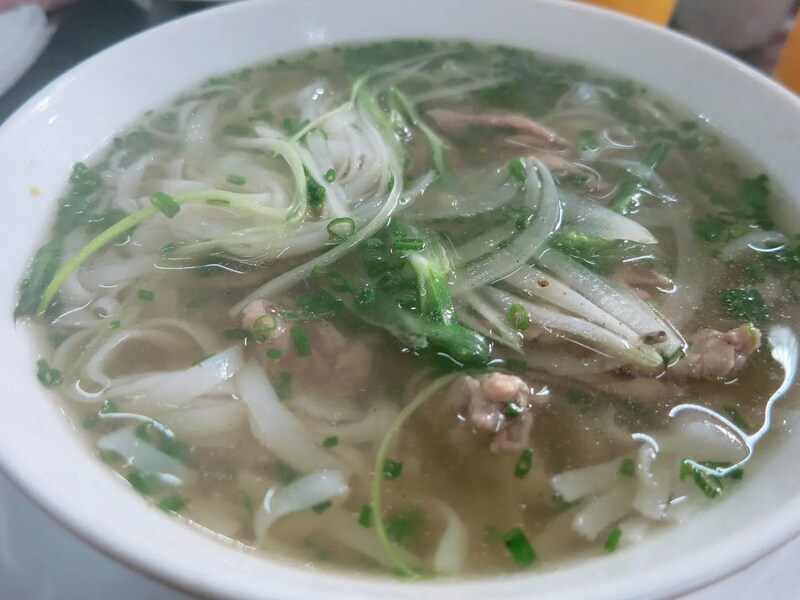 If you want authentic pho ga or pho bo, then this is the pho to be. And it was great that they offer smaller bowls for children. Ynna tried the ca phe sua da while I tried their passion fruit juice! Both are highly recommended! 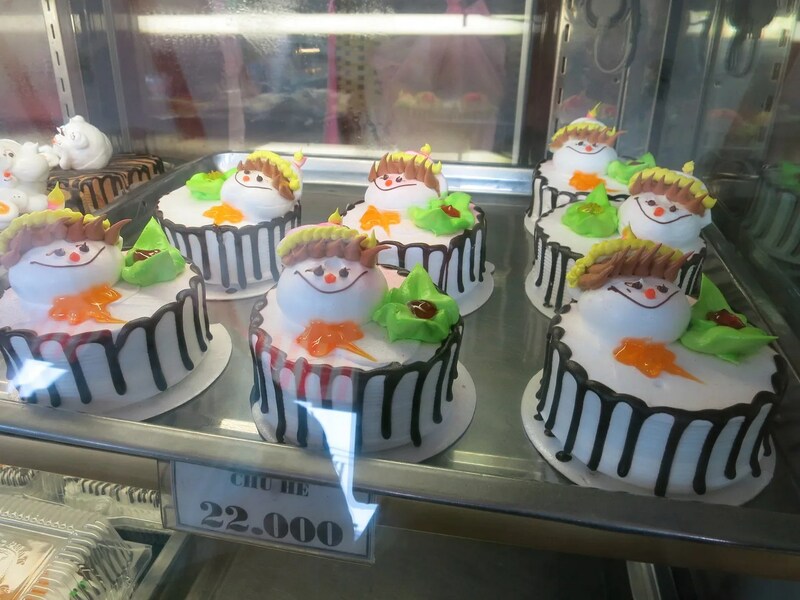 After a filling breakfast, we walked to the nearby bakery, where the kids chose 2 cakes to take with them till the end of the tour. The cake that still resembles a cake by the end of the tour wins. Sam brought home a blob if you wanna know. It was an awesome bakery! 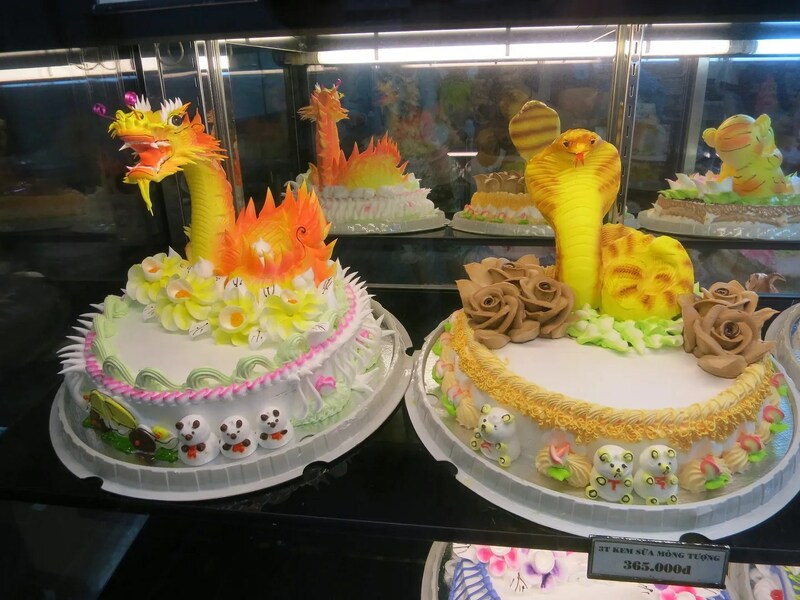 They’ve got cakes for every zodiac sign. It was incredible! And they also bake huge breads! 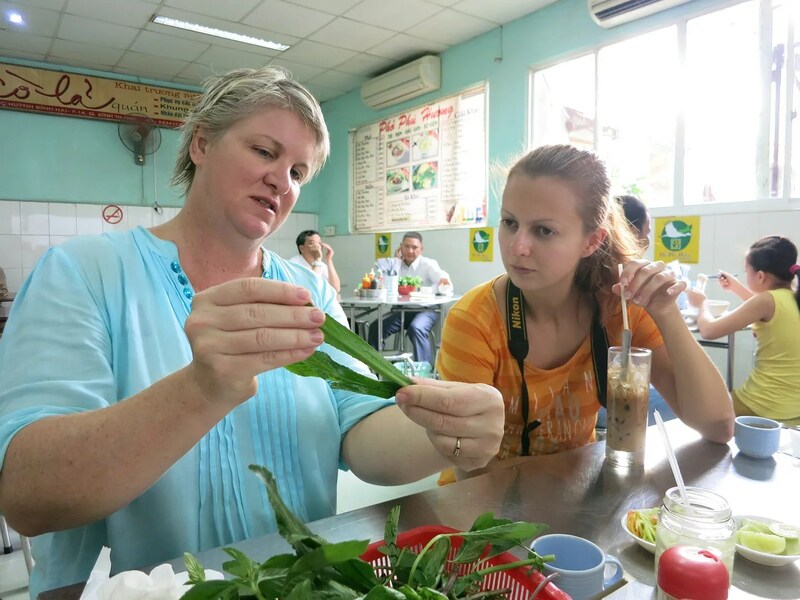 Barbara introduced us to the way of life of the Vietnamese by talking about food. 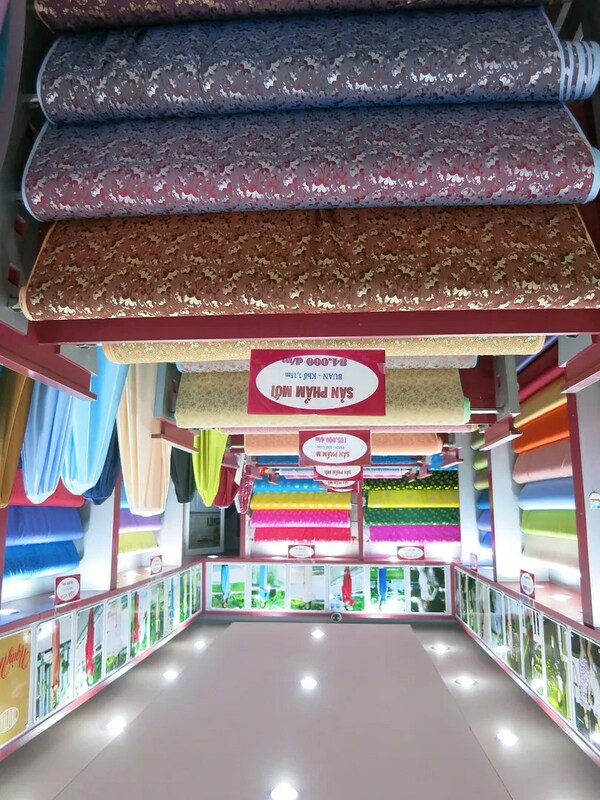 It was difficult not to stop and just try everything. 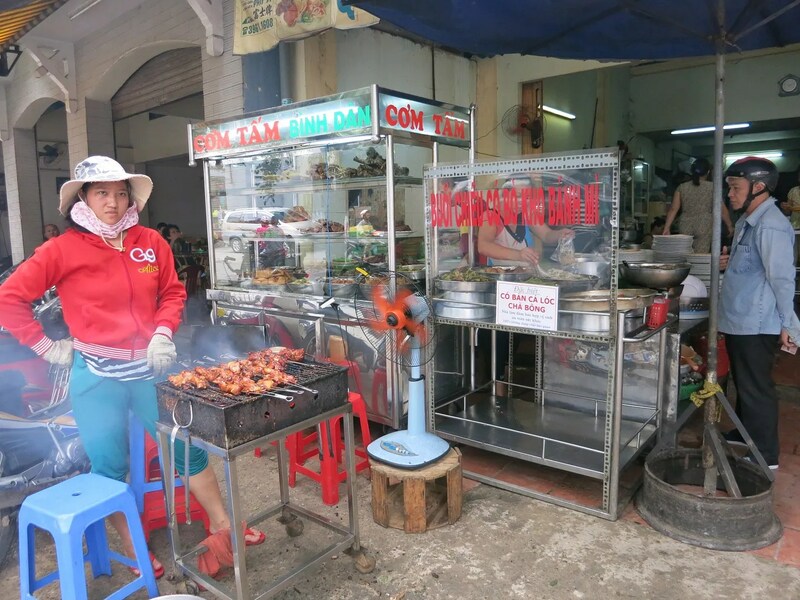 The pork barbecue at Com Tam Long Xuyen smelled enticing. 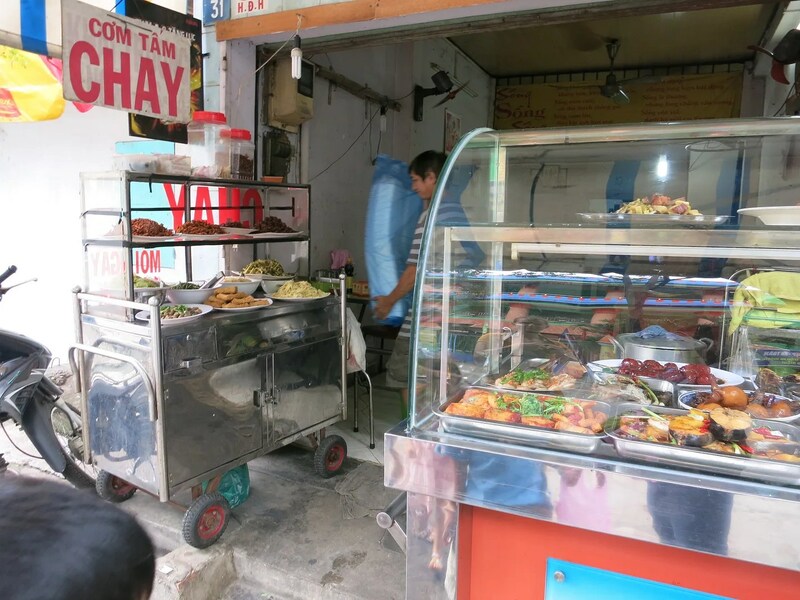 Around the corner was Com Tam Chay with all their savory viands ready for all to see. A few meters ahead, another was barbecuing too. Argh. I get week-kneed when I smell a barbecue. 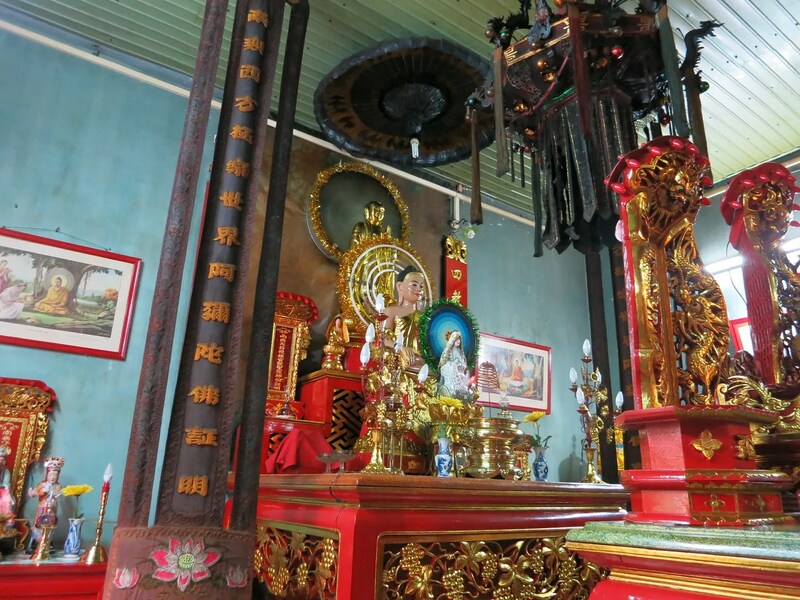 We ducked into another hem to visit the a family temple which is a place of worship for the family’s ancestors. There was a “mountain” in the middle of the garden. Mountains are one of the more popular symbols in Buddhism. 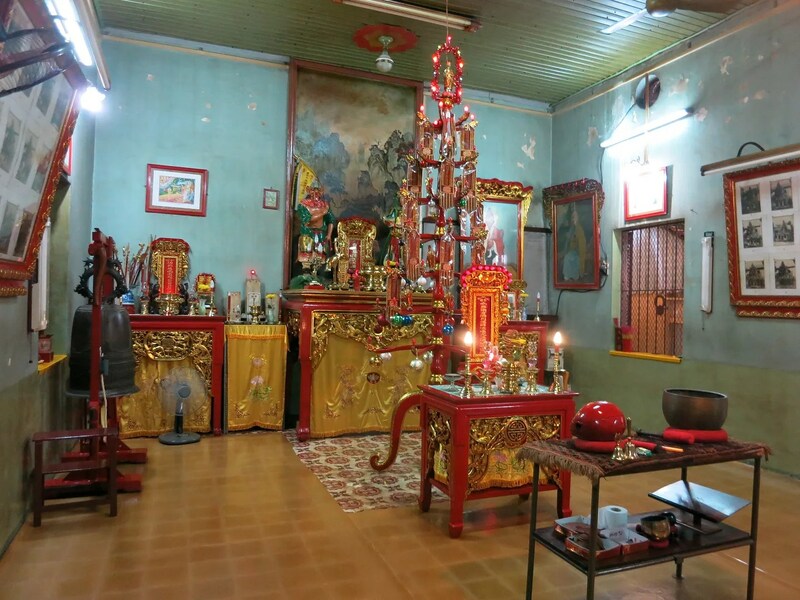 Ancestor veneration is not uncommon in Vietnam and is actually an influence by the Chinese. I kinda understand it. Your ancestors must have a direct line to Heaven, so why not talk to them? Chi Pauline — one of the elders of the family, opened their doors to us and we were astounded by their temple. 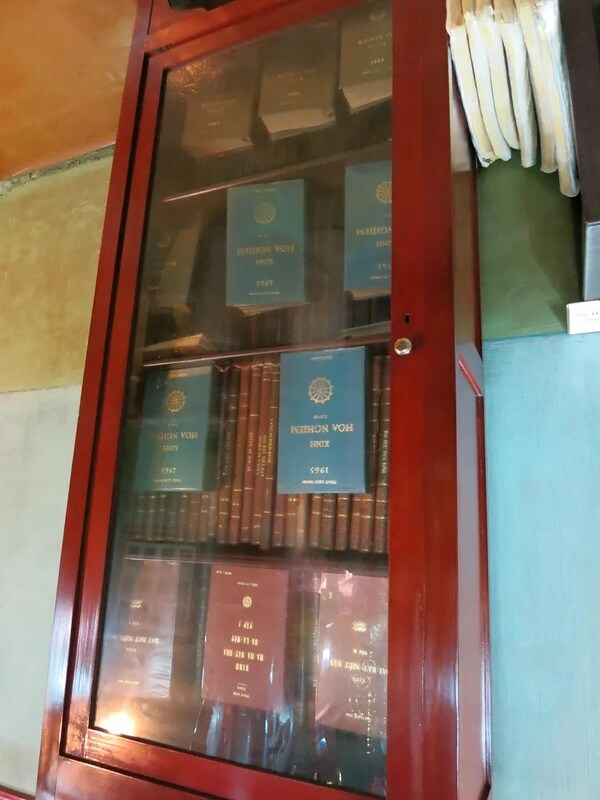 They’ve even managed to keep really old Buddhist manuscripts. 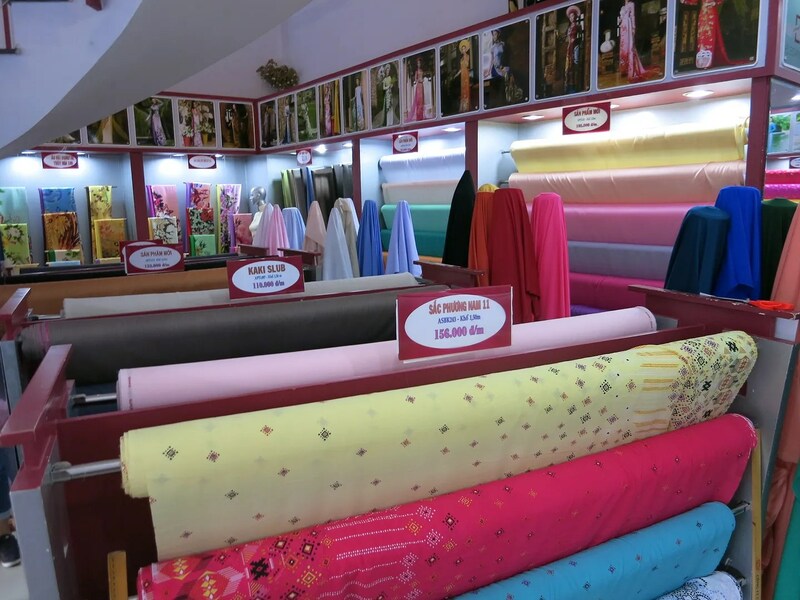 To continue our history lesson, we visited a textile shop for ao dai — the Vietnamese traditional dress. It was wonderful! 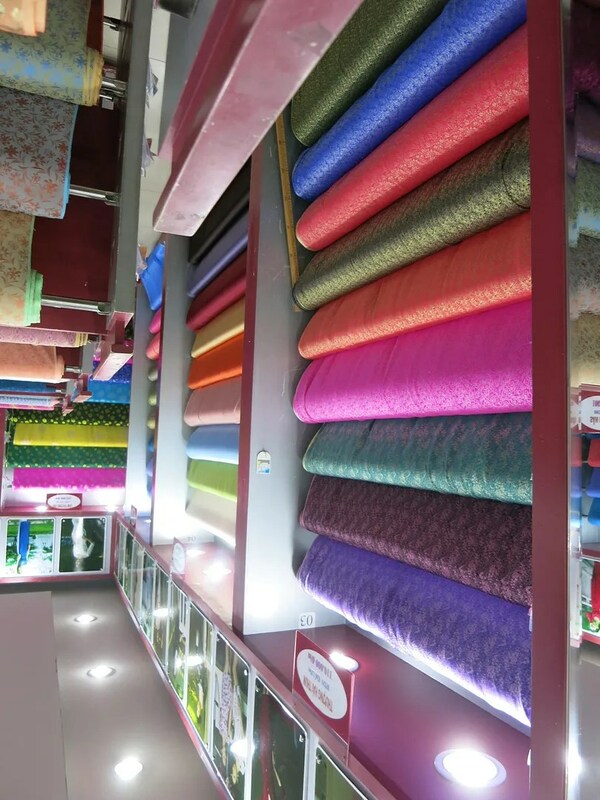 I love textile and how I wish I’ve gotten to see this shop before I had my first ao dai made! Seriously, I am not too keen with our PH national dresses as they’re voluminous, hot, and itchy (The itchier it is, the more expensive it is. I kid you not!). I love how beautiful ao dais are made and yes, you wear pants! I love pants!!! Next stop was the Cho Ba Chieu! 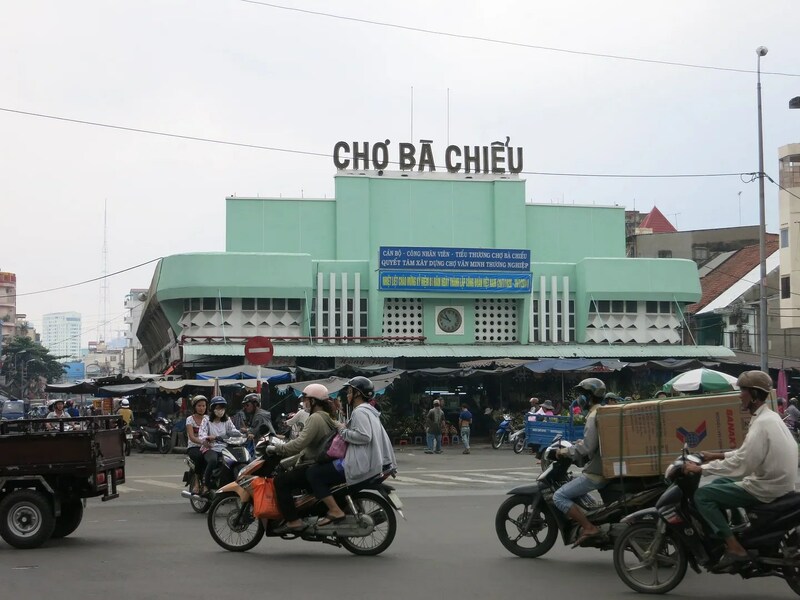 I have only been to a few markets in the city and Cho Ba Chieu is easily my favorite or maybe we just didn’t get there early enough and there wasn’t much traffic compared to Cho Binh Tay where people bump into you a whole lot. 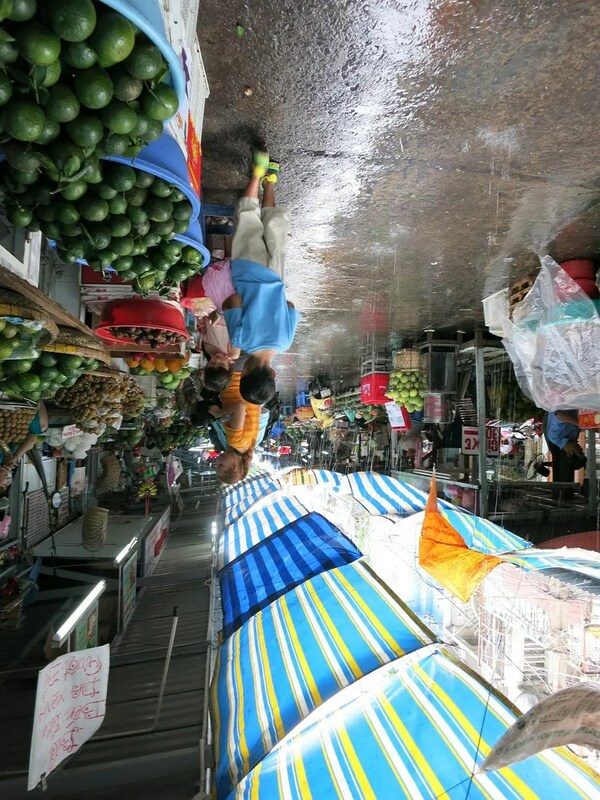 It was interesting to learn that it’s not uncommon for locals to do 2 or 3 trips to the market in a day just to make sure that they’re cooking the freshest meal. 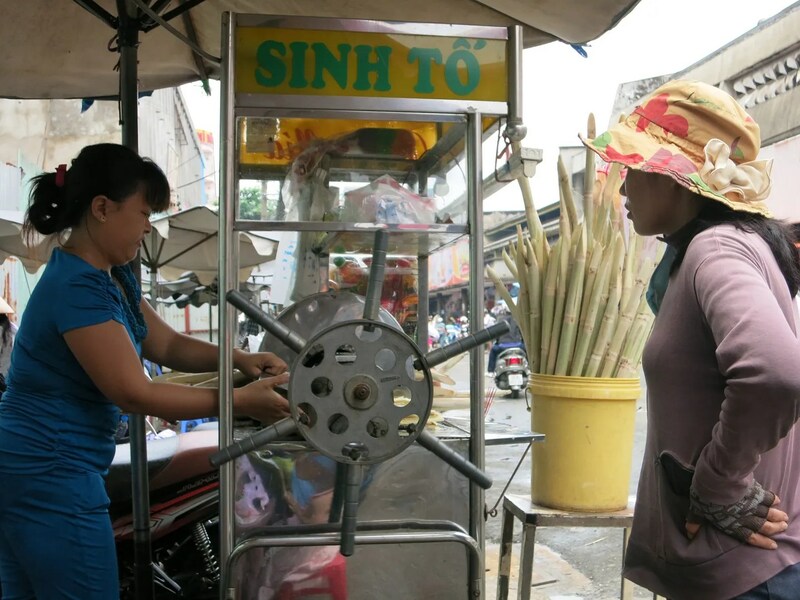 Cho Ba Chieu is designed in such a way that motorbikes can easily go round the market and make stops to buy fresh produce. 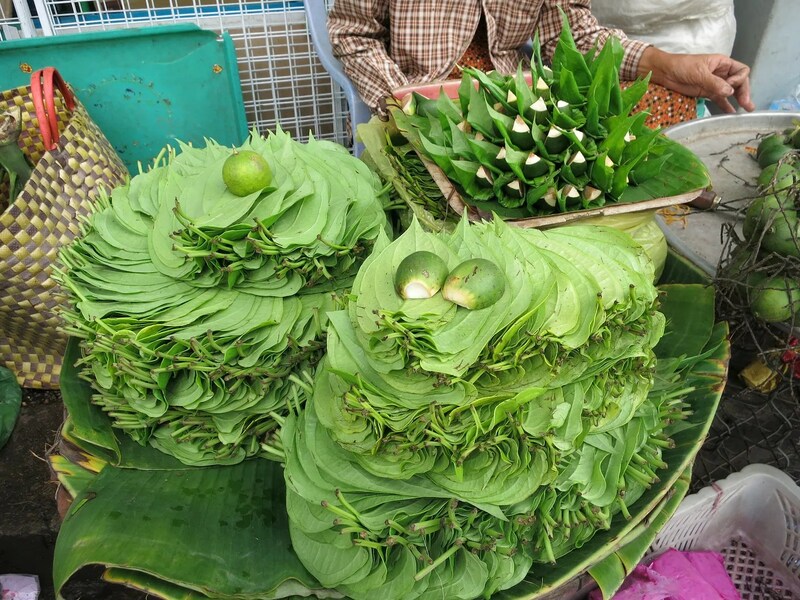 On our way, we stopped by a betel vendor. 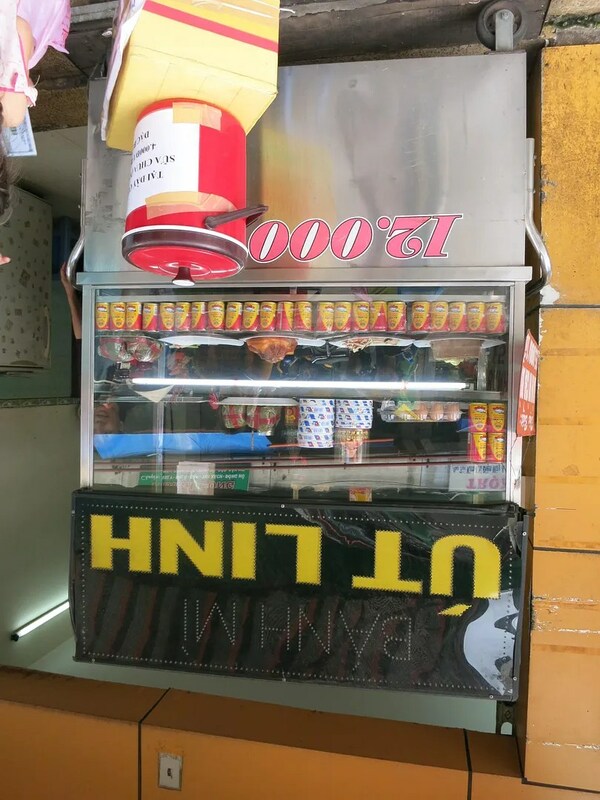 I knew that this is illegal in some countries, but apparently, it’s not illegal in Vietnam. The Banh Mi vendor for our lunch —If you love Subway, this is way better! I smile when I see expats put chili or sweet chili in their Subway sandwiches, it’s very Vietnamese. Rice cakes. 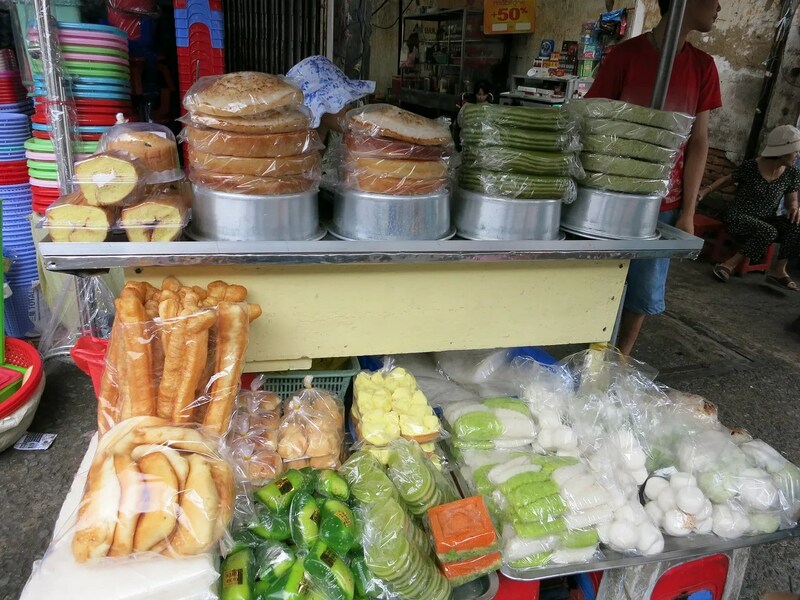 I bought the banh bo which tasted just like our Filipino puto — which is Sam’s favorite. And sugar cane juice. This is actually the first time I’ve tried sugar cane juice with a dash lemon. It’s actually pretty good! Been wanting to try this for a long time but wasn’t quite too sure. 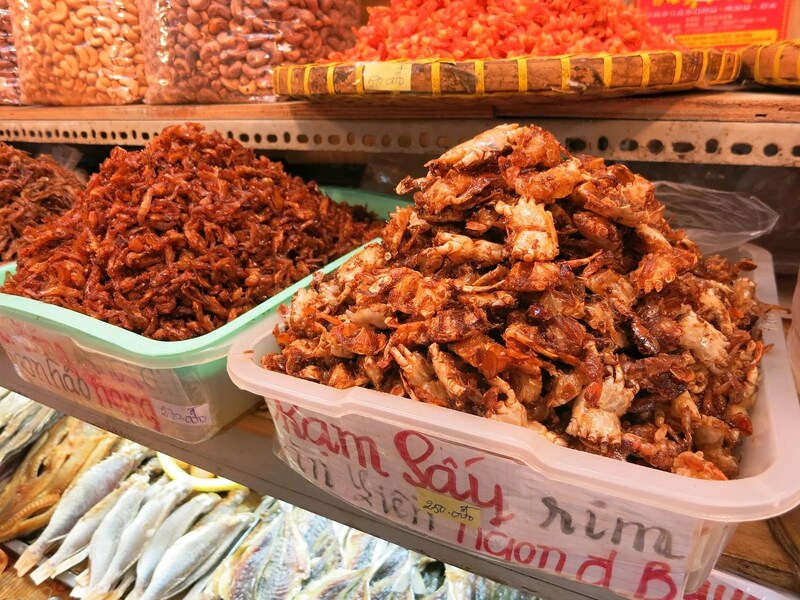 We tried the sweetened dried crabs too for lunch and it went well with our banh mi! So good! Outside, we checked out the seafood. 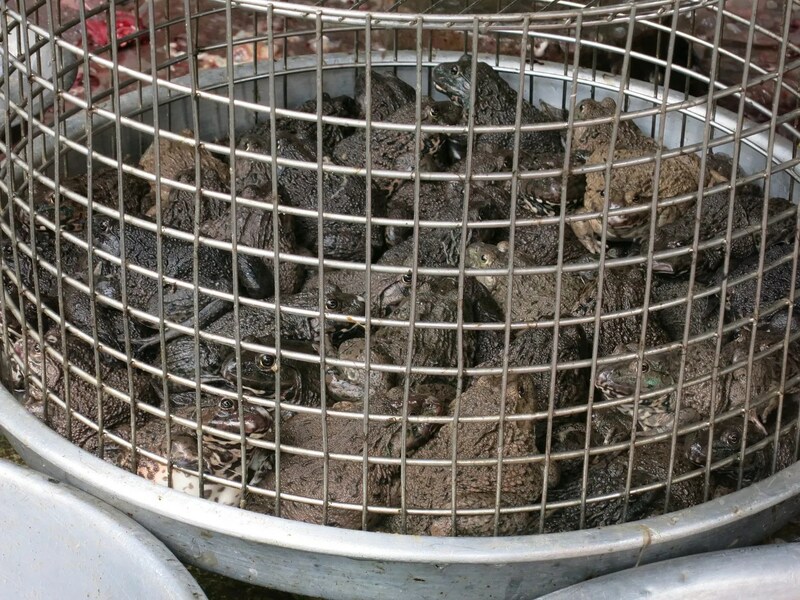 Sam couldn’t stop talking about the daddy, mommy, and baby eels — and the big frogs! Ribbit! 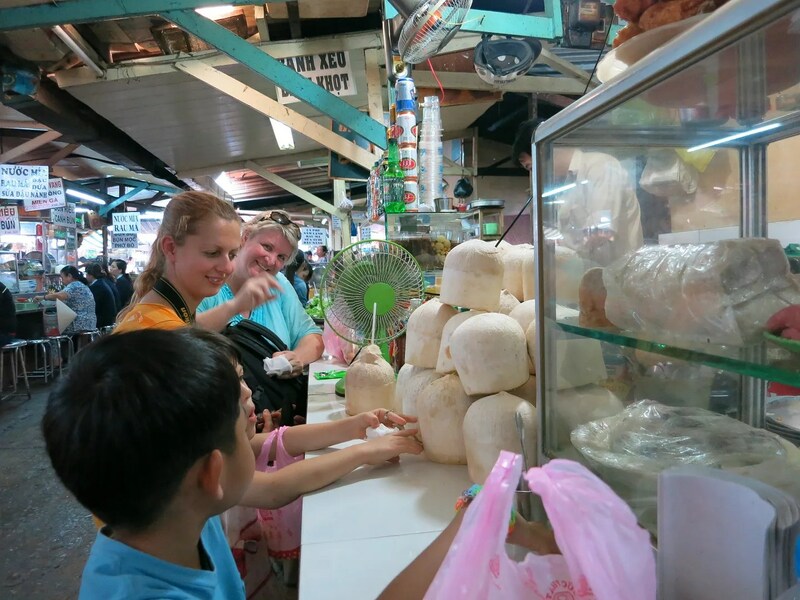 We stopped for a bit to get coconut juice and try the banh flan. 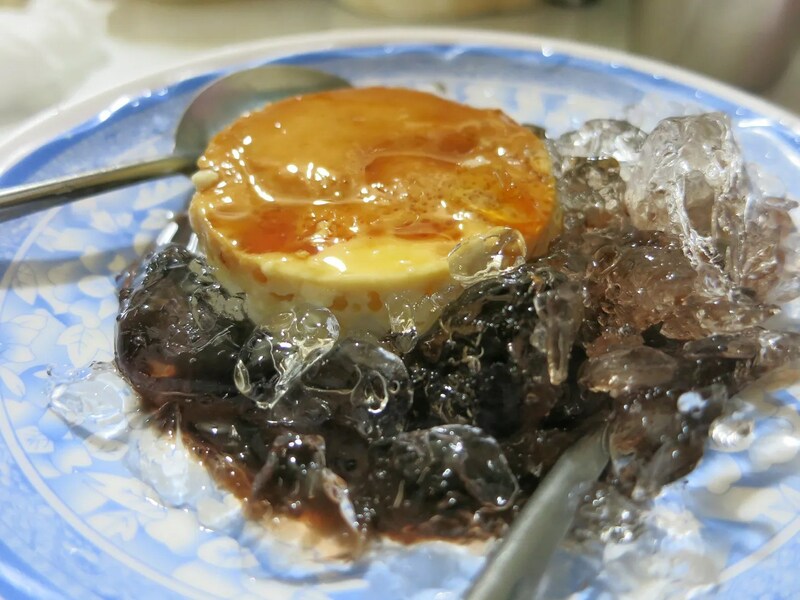 In the Philippines, we call this “leche flan”. And no, we don’t put ice on it. But this is a good way to dilute the sweetness a bit. 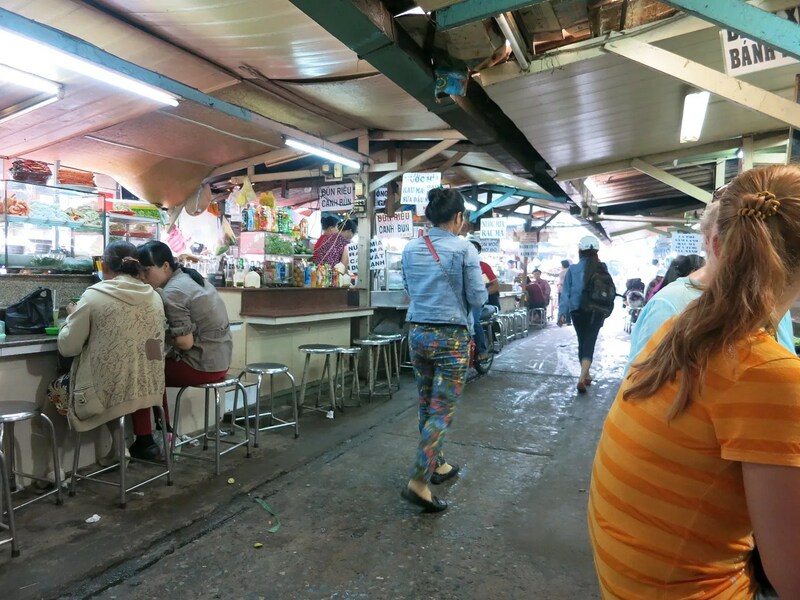 This part of the market where you can get a bite to eat is not free from motorists. As we ate, motorbikes zipped by behind us. Can anybody tell me what this fruit is called? Then it began to rain! But that didn’t stop us to continue our gastronomic tour! 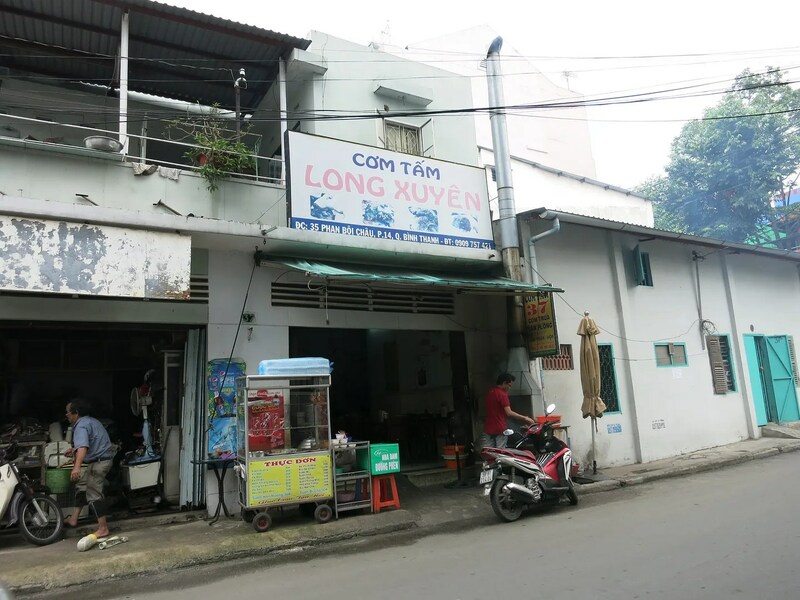 On our way to the Le Van Duyet temple, Barbara pointed to us the shredded pork skin that looked like noodles. I wonder what it’s used for. Our last stop was the Le Van Duyet shrine that was surrounded by a beautiful park — where we were supposed to have a picnic. But because of the rain, we ate at the sides of the temple. Le Van Duyet was a general that helped vanquish the Tay Son rebellion in the 1800s. His tomb is also in this complex. 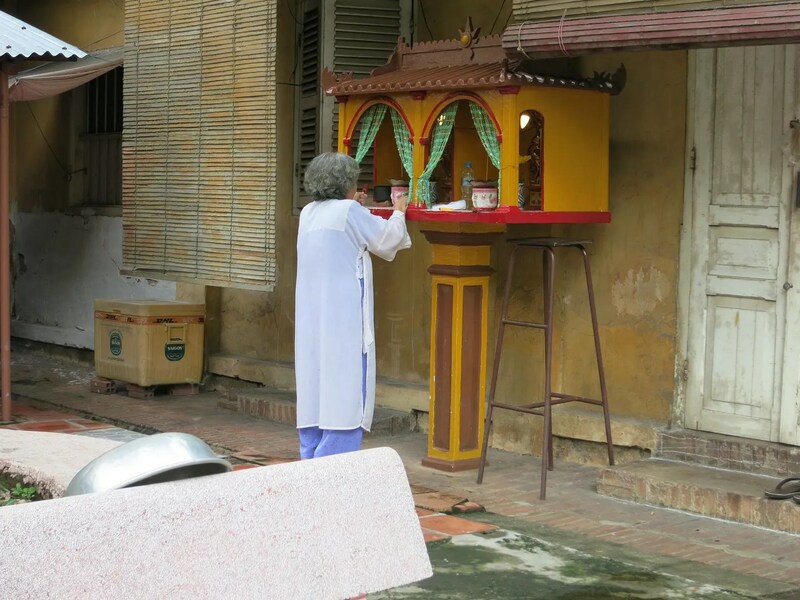 People come to visit Le Van Duyet to seek answers on love, career, lost loved ones, health, and wealth among others. Then off you go to the cabinet of mysteries where your “answer” is written. The funny thing is, since Le Van Duyet is Vietnamese and speaks only Vietnamese, questions in English may have doubtful answers. 😛 It’s safe to say my son won’t get his horse. Then at lunch, we tried all the food that Barbara was hoarding all through out the tour. The highlight was Ynna trying the poop fruit. 😛 By the time we were done by 2 pm, we were tired and couldn’t eat a bite more. I took home most of the stuff we didn’t finish eating. My nanny was very happy with the century egg! I was too! She mad an awesome congee! 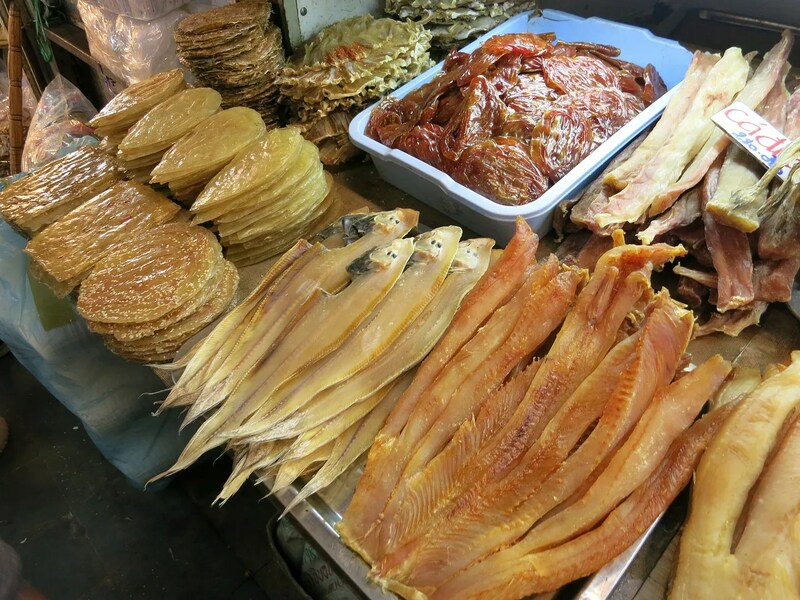 The shredded pork skin is used in broken rice (cơm tấm) and bread, you should try! The small black fruit that you asked is called “Tram”. I often tried it when I was a child. It might cause a purple mouth. Love to see you explore my beloved hometown since I am apart from it now. 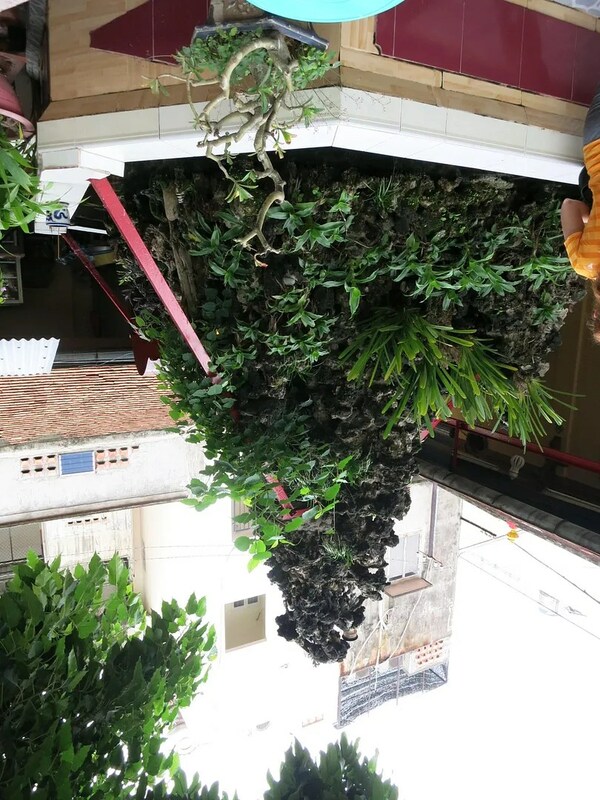 Pingback: Ho Chi Minh City – Gateway to Fab Holidays | Hello Saigon! Pingback: Work Face: On | Hello Saigon!